Washington: A group of astronomers has estimated that as many as one in four stars similar to the Sun could be orbited by Earth-size planets. A five-year observation of 166 stars within 80 light years of Earth, using the powerful Keck telescope in Hawaii, counted planets orbiting the stars, down to the smallest planets now detectable by telescopes. In findings to be published in the journal Science Friday, the researchers found larger numbers of smaller planets than of larger planets. Although the smallest planets they saw are still several times the size of Earth, the findings caused them to conclude that Earth-sized planets could be even more common. "Of about 100 typical Sun-like stars, one or two have planets the size of Jupiter, roughly six have a planet the size of Neptune, and about 12 have super-Earths between three and 10 Earth masses," astronomer Andrew Howard said. "If we extrapolate down to Earth-size planets -- between one-half and two times the mass of Earth -- we predict that you'd find about 23 for every 100 stars." The scientists found 33 detectable planets orbiting 22 of the stars and then used estimates to conclude that 1.6 percent of the stars had Jupiter-sized planets and 12 percent had super-Earths. They also found 12 possible planets that need to be further examined. Previous studies have looked only at larger Jupiter and Saturn-sized planets. Astronomers hope to be able to find planets similar to Earth that also are close enough to their suns to be warm and have liquid water, but far enough away to not be boiling in the so-called "Goldilocks" zone, where conditions are just right for life. Last month, a group of US-based scientists said they had discovered what might be the first habitable planet outside Earth's solar system. The team of planet hunters found an Earth-sized planet -- three times the mass of Earth -- in orbit around a nearby star at a distance where liquid water could exist on the surface. Scientists hope the Kepler space telescope launched last year, which is finely tuned enough to detect Earth-sized planets orbiting distant stars, will find more such planets. 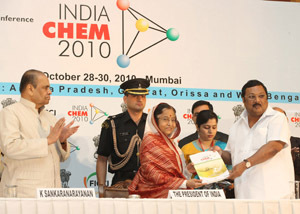 President Mrs Pratibha Devisingh Patil receiving a handbook on India Chem-2010 from Union Minister for Chemicals & Fertilizers M. K. Alagiri at the inauguration of the India Chem-2010 International Exhibition and Conference in Mumbai on October 28, 2010. Governor of Maharashtra K. Sankaranarayanan is also seen in the picture.